When you have a chance feel free to take a gander. 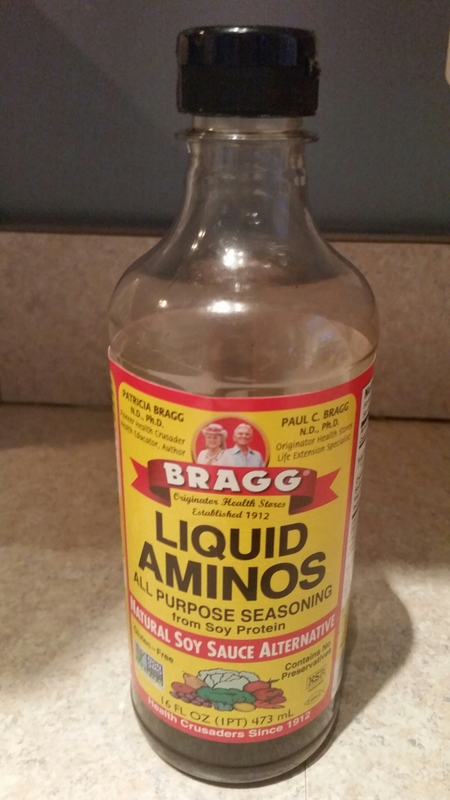 1/4 cup of Bragg Liquid Amino. The key component of this recipe is cooking the ingredients in batches. 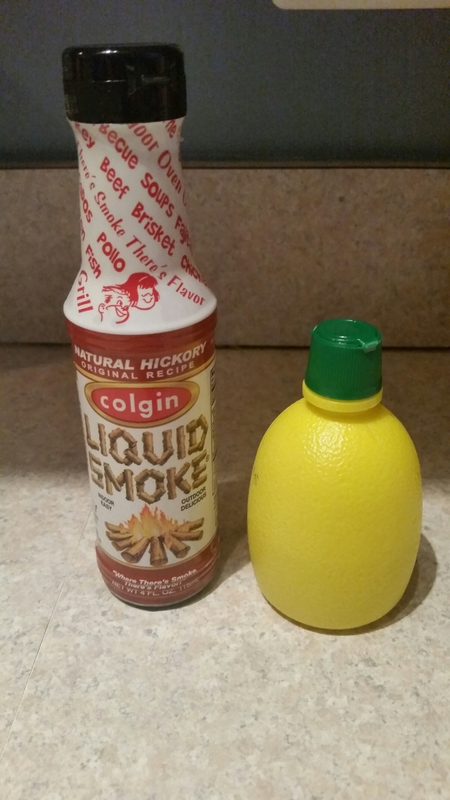 Add 2 tablespoons of Liquid Smoke and lemon juice. Add rosemary and dill until lightly covered, shake and set in the fridge tightly covered. 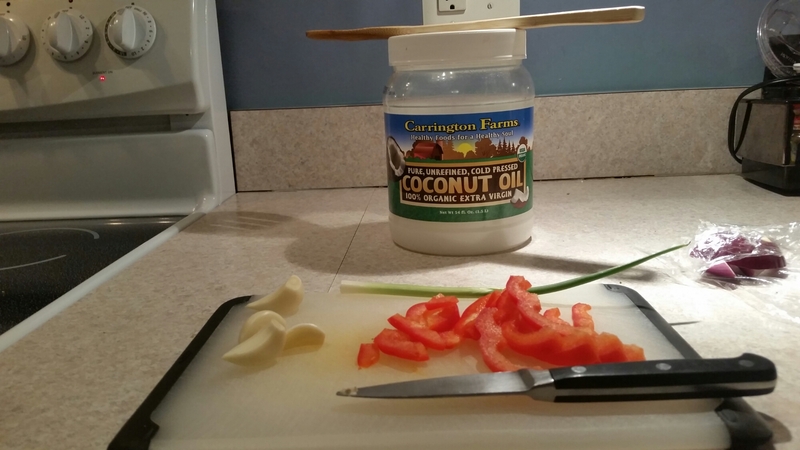 Thinly slice your onion, garlic and quarter your peppers, add a 1/4 tablespoon of grapeseed oil and mix in a small bowl. Add to high heat continously mixing until carmelized, remove and set aside, a medium sized skillet is best. Follow with the mushrooms, 3 minutes stirring vigorously – set aside. 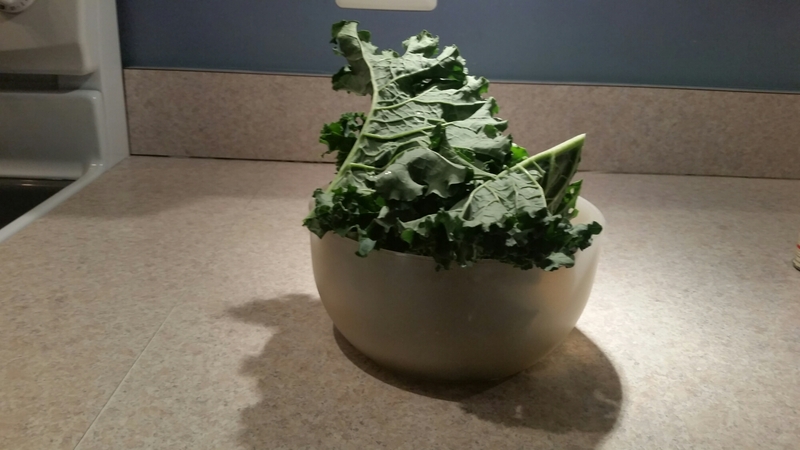 Add the cut and cleaned kale, cook until the kale is a bright green color, mixing continually. This will take roughly 3 to 4 minutes over high heat. Quinoa is an easy fix, 1 cup of quinoa for 2 cups water. Bring to a boil, reduce to a simmer until all of the water dissolves, which is about 10 – 15 minutes (You can prep this before or use leftover quinoa, which is what I did for this recipe). Add the scallops to the skillet, scoop them out of the marinade, don’t dump it. 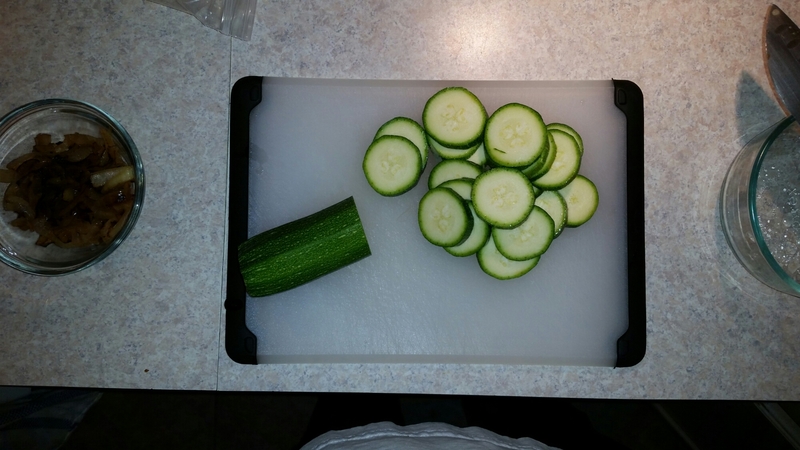 2 minutes each side, remove and set aside. 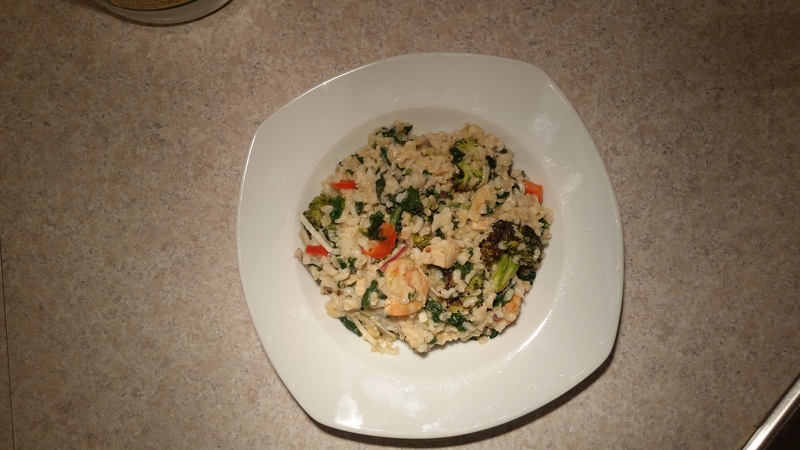 Add all of the ingredients to a warm skillet and mix for 2 minutes, you just want to warm and marry the flavors and 1/4 cup of Bragg Liquid Aminos. I apologize for the layoff, it hasn’t been for lack of appetite, but I fully intend to bring everyone back up to speed on my exploits in the kitchen and some of the marriages of contrasts. Scallops are one of my favorite seafood items, especially sea scallops, they get the nod over the smaller bay variety. Overwhelming them with a marinade is a danger best avoided. 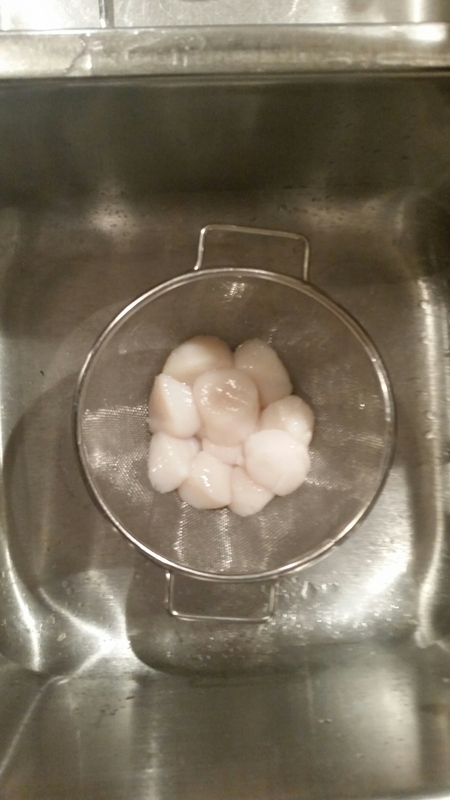 3/4lb of sea scallops, rinsed. 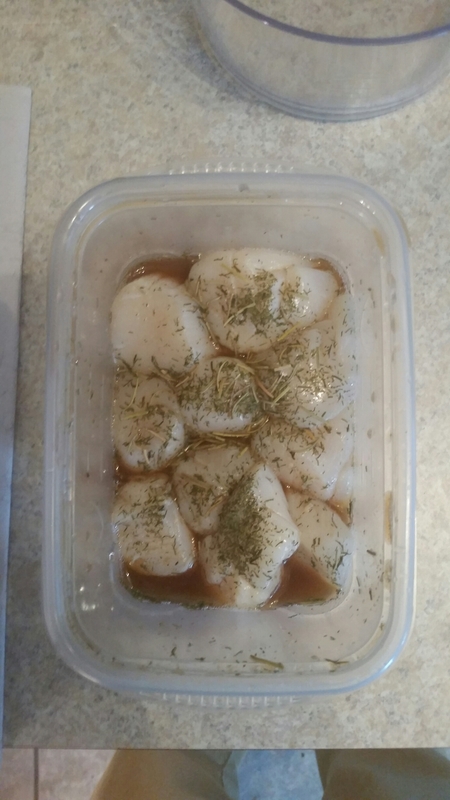 Let the scallops sit in the marinade for a half hour, place in the refrigerator while prepping the other ingredients. 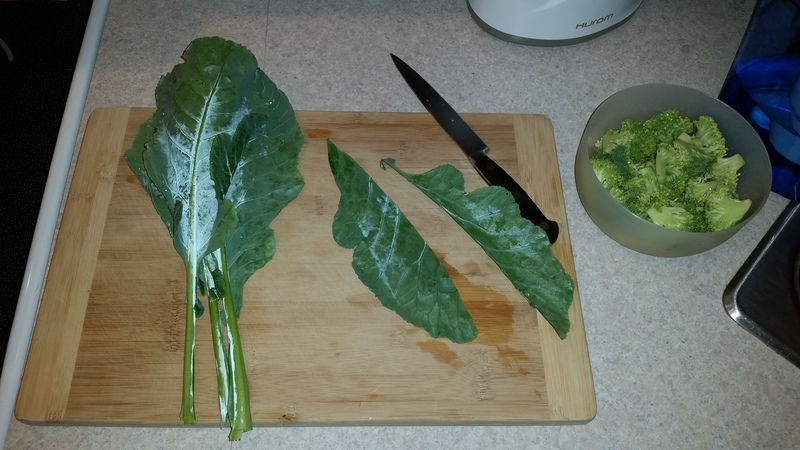 Prepping the kale, cut rinse and wash. I like to use 1/4 of baking soda in cleaning them. I mention the roll cut technique in previous recipes. After draining the water I add the kale to a small bowl and add 2 tablespoons of peanut oil, toss and add to a pre-heated skillet. Give it about 4 minutes on medium heat. Turn your attention to the savory portion of the recipe. This is what will add the bite, slice don’t mince. At the 4 minute mark add them to the kale in a pile and let them carmelize before stirring them together. Remove from the heat and set aside after a total of 7-8 minutes – don’t overcook. The scallop part of the recipe is easy. 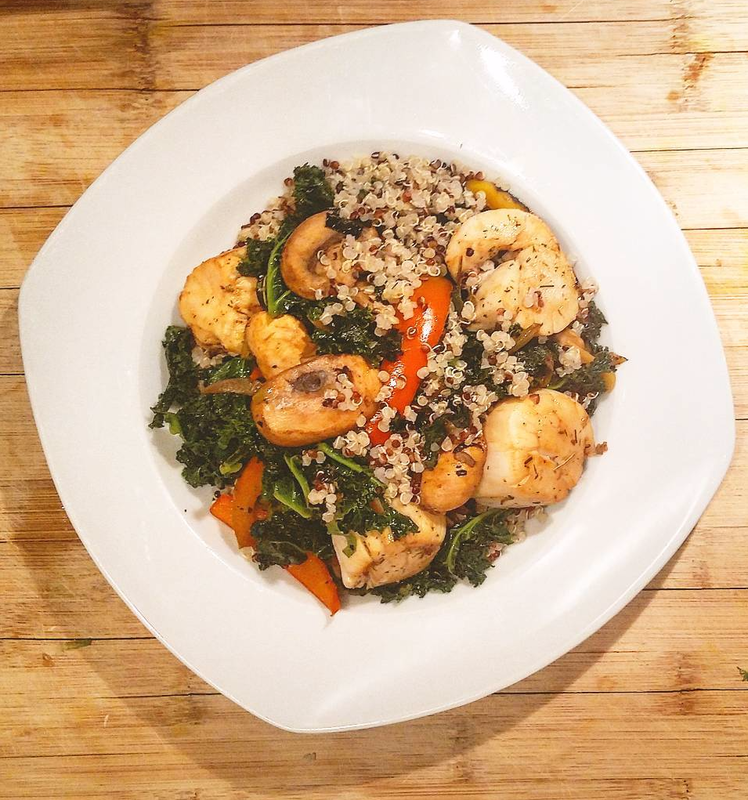 Add a layer of peanut oil… Using the same skillet that you removed the kale from is an option. Pour the mixture in its entirety into the skillet. 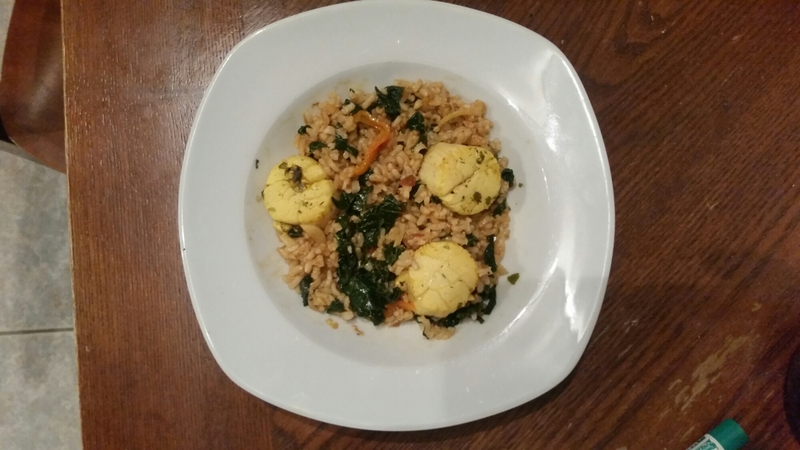 Two minutes each side – and it’s a wrap, overcooked scallops are tough and terrible. Remove and take one to the head, you’ve earned it. The tumeric and lemon juice gives it a glow. 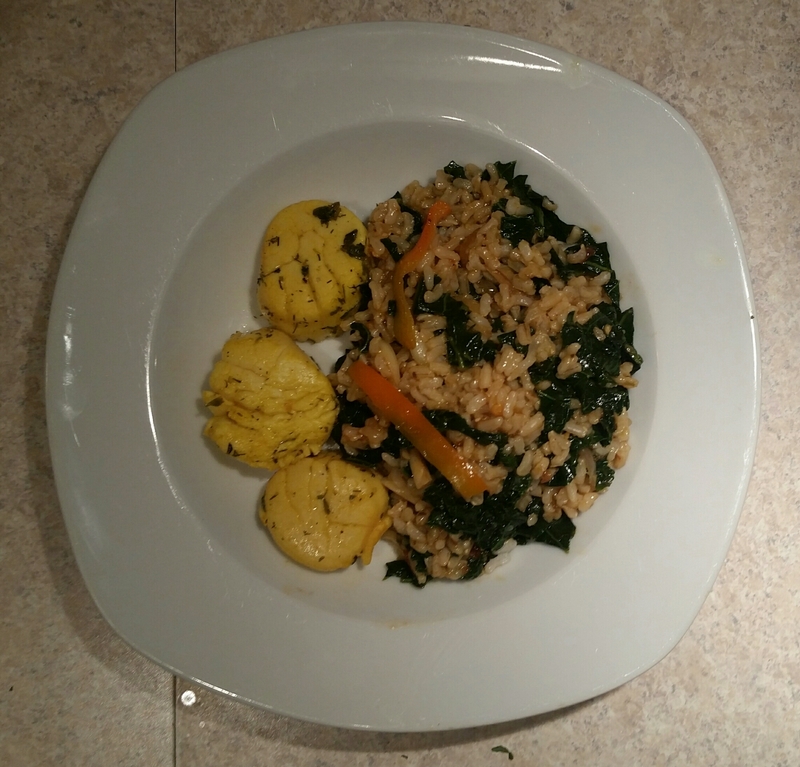 Mix the brown rice with the kale and pepper garnish that was set aside earlier and call it dinner. In all this should equate to 15 minutes prep time and 11 – 12 cooking time. 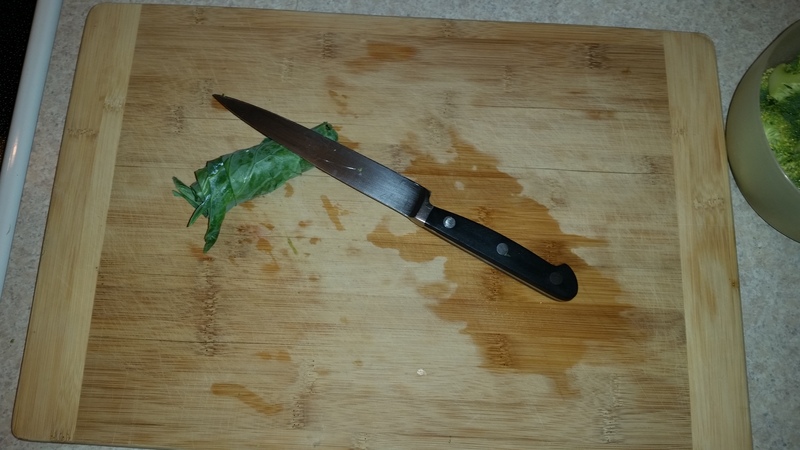 The challenge that I always have with basil is that I allow it to lanquish. I made it a goal not to let it happen again. I had a good grouping of leftover ingredients to pair with some salmon steaks that I thawed out. 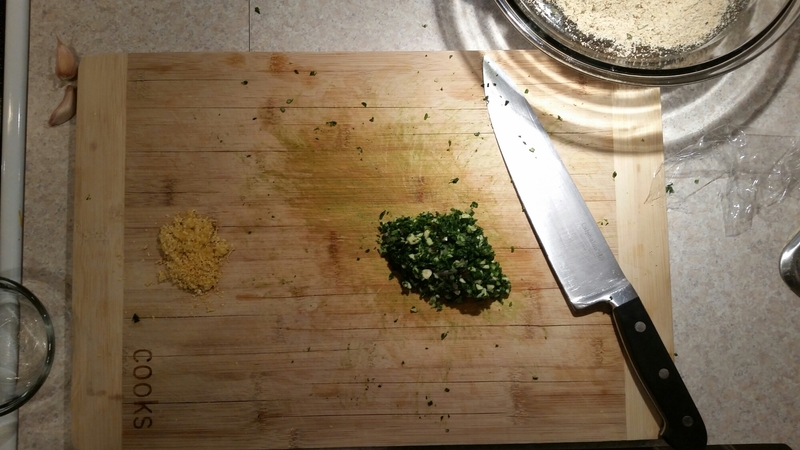 2/3 cup of chopped fresh basil. Layer a pan with aluminum foil and spray with canola oil, lightly. Finely chop the basil, garlic, red pepper and add the lemon juice to the salmon steaks. The lemon juice will balance out the heat of the hot pepper. Cover and put in the refrigerator for 20-25 minutes. Remove from the marinade and place the salmon steaks in the pan. Add the chopped ingredients on top of the steaks. After placing in the oven on broil cook for 7 minutes, flip the steaks and cook for another 7 minutes. I paired the steak with some red rice, roasted potatoes and green beans… You can reference my prior recipes for the broiled potato and green bean bake. It started innocently enough. 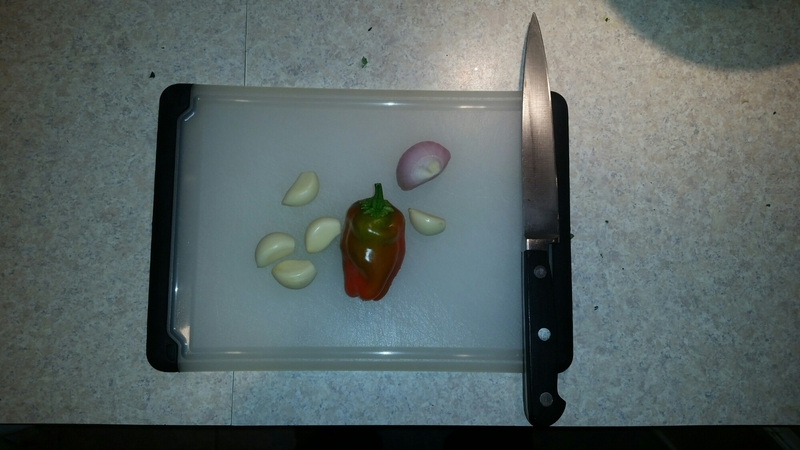 I had the orphaned remnants of a red pepper, red and green onion along with a couple of cloves of garlic. 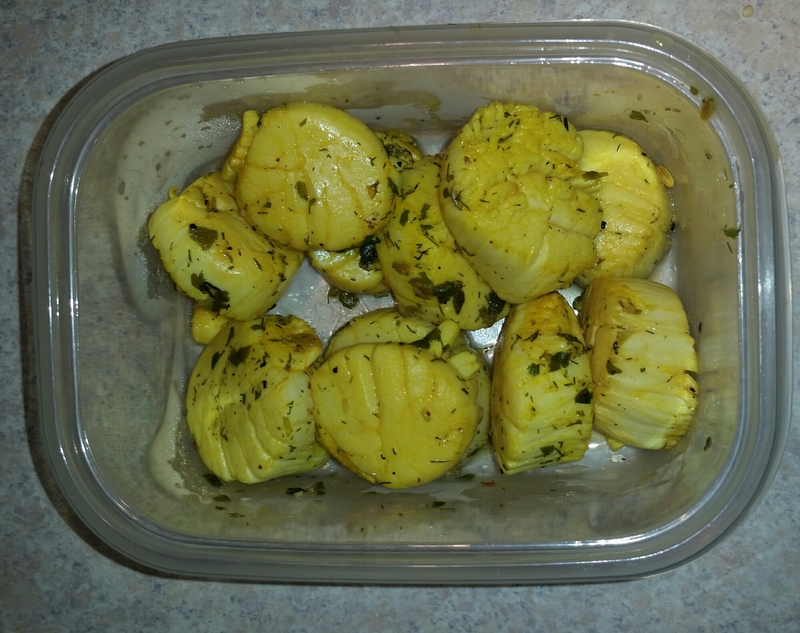 I sliced them thinly with the intention of carmelizing them in some coconut oil. Upon further research I had a head of broccoli, half container of baby spinach, a small amount of Beyond Meat chicken strips and an opened bag of raw shrimp. I was certain I could join all of these ingredients in holy culinary matrimony. So I had at it. 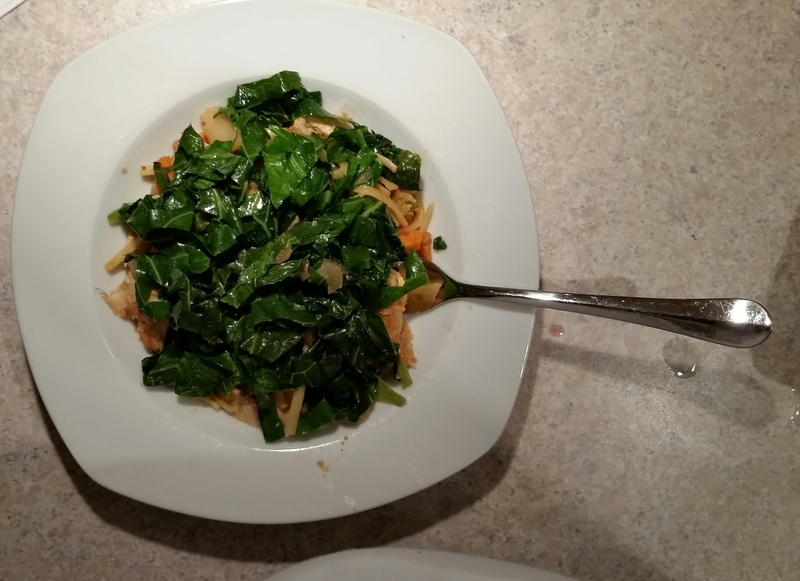 I sautéed the spinach in the coconut oil first. Roughly 3 to 5 minutes under medium heat, making sure not to overcook it and setting it aside. 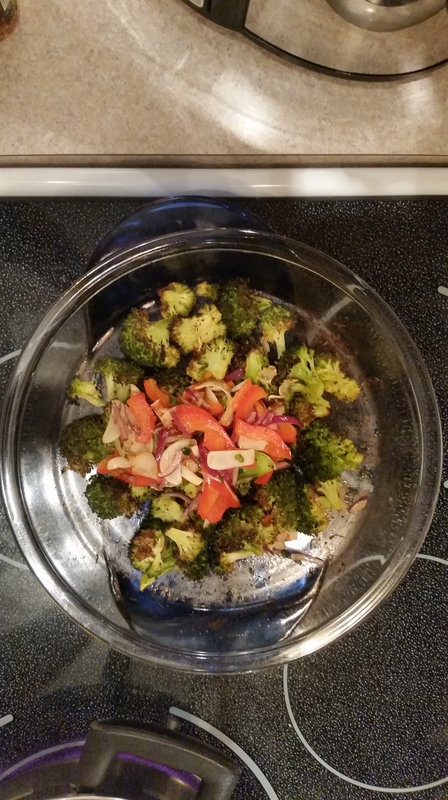 Cutting the broccoli into bite sized pieces, tossing it in coconut oil and roasting it in the oven at 425 degrees for 20 minutes was the course of action I took for it. 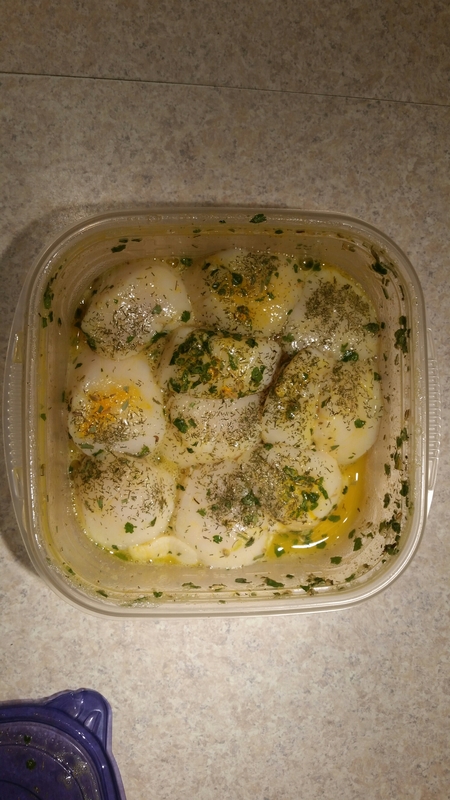 In the meantime marinating the shrimp in some lemon juice and dill. 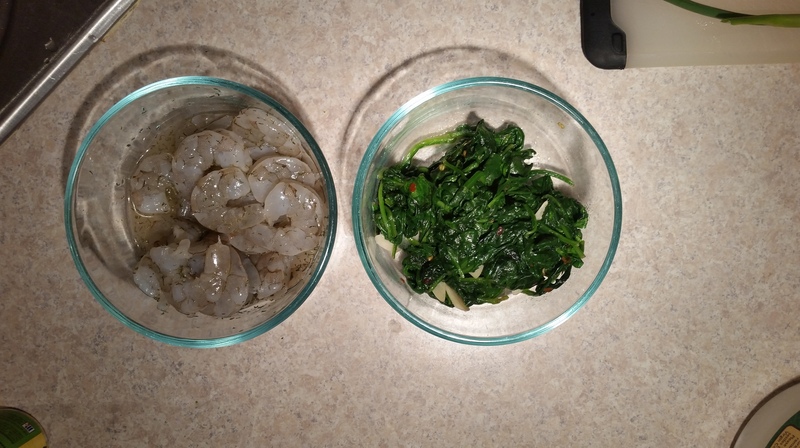 After removing the spinach from the oil, I added the chopped pepper, onion and garlic mixture. Letting it carmelize will take 3 to 4 minutes. After removing the broccoli from the oven place the mixture on top of the broccoli and set it aside. 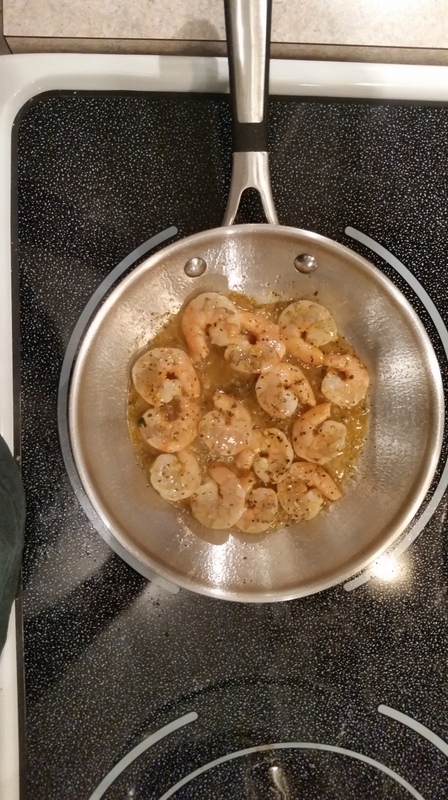 Lightly layer the pan with the oil and add the shrimp. Cook 3 minutes each and remove. I had a lemon simmer sauce that I brought to a rolling boil. 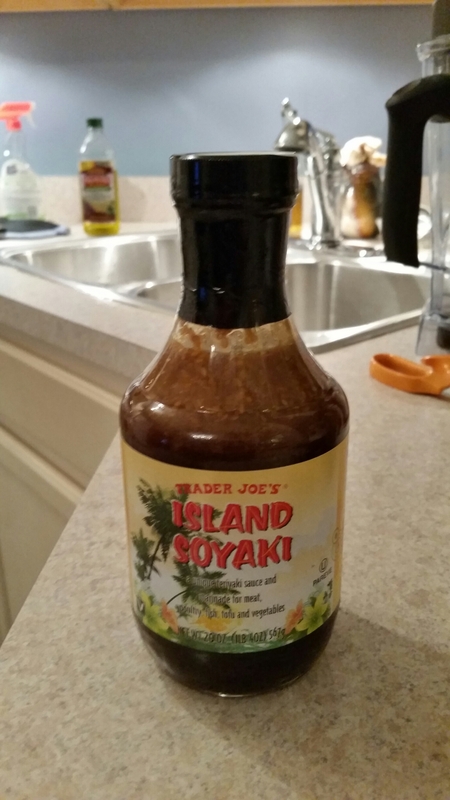 Adding all of the ingredients to the sauce brought it to closure. Viola! 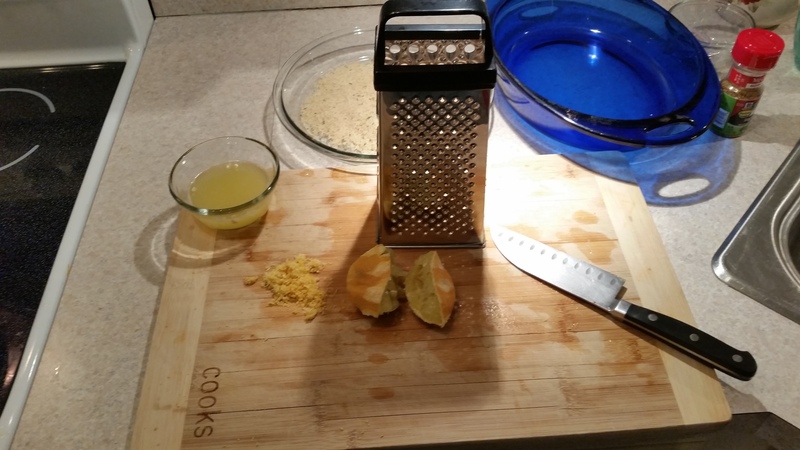 Start with squeezing of lemons, set the juice to the side and use the rinds to make lemon zest. A grater like the one below should be ideal. 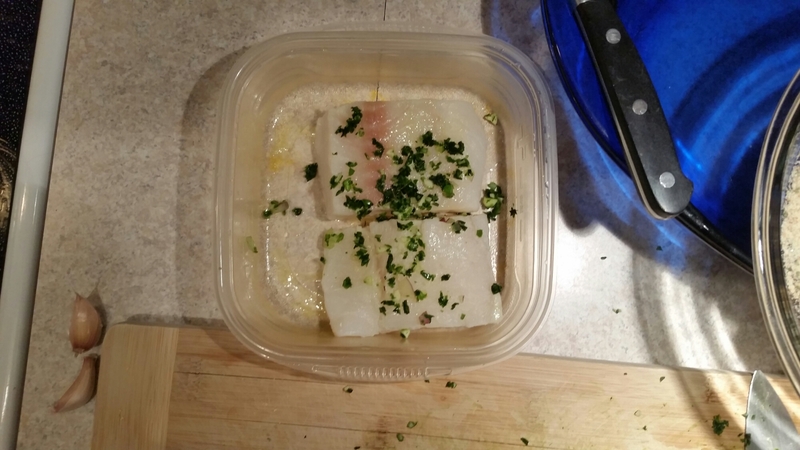 You’ll need 3 to 4 pieces of cod. 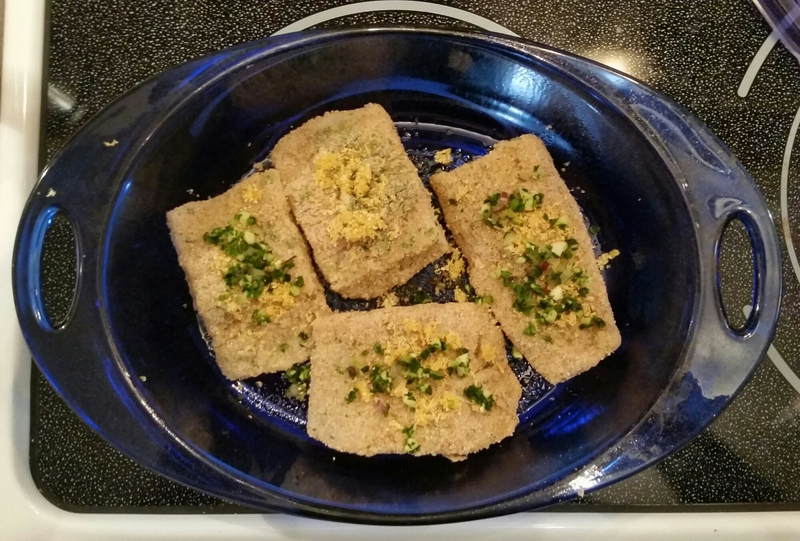 1 cup of bread crumbs in a shallow pan. Mince the leeks and garlic. 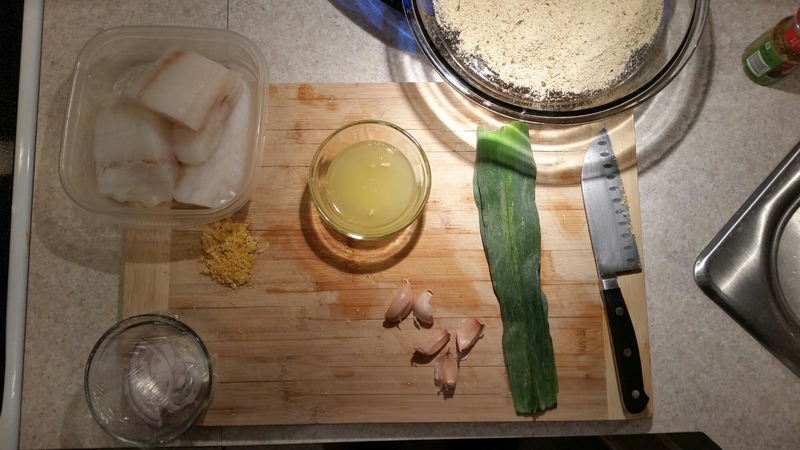 Add the chopped leeks and garlic to the cod and the lemon juice. Lightly coat with the bread crumbs. Add to a pan lightly coated with olive oil. Top each piece with a spoonful of lemon zest. Add to the oven uncovered for 20 minutes. 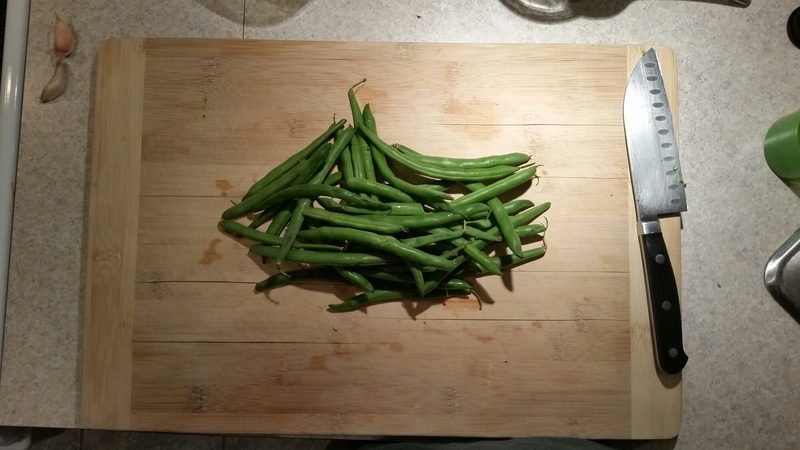 In the interim cut some fresh green beans. Toss with some olive oil and add the remainder of the chopped leek mixture and place in a shallow plan in the oven. 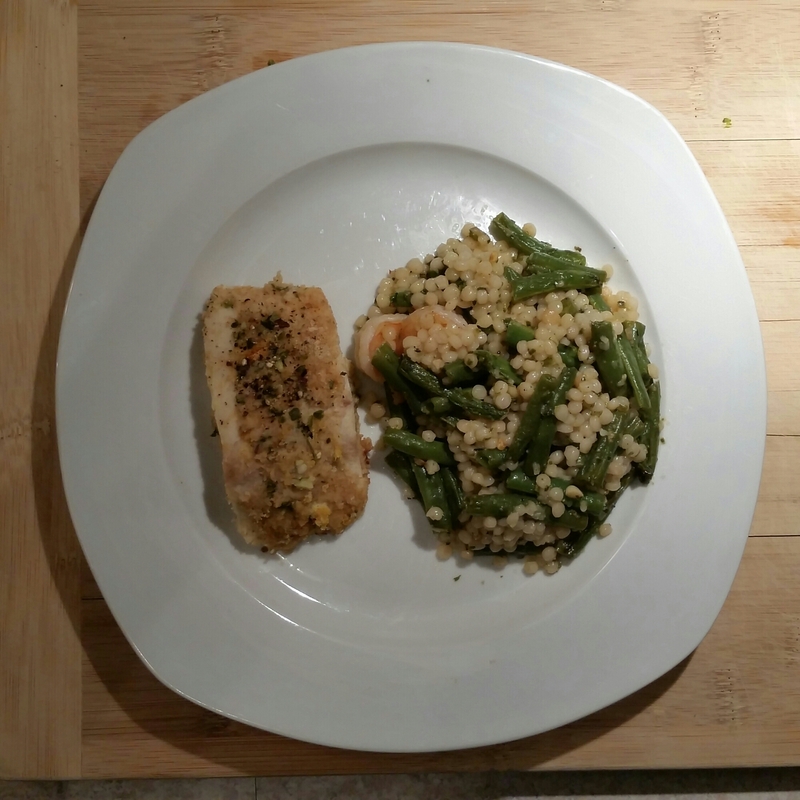 Add some pearled couscous to the mix and serve it hot. When broiled vegetables meet tofu in a glaze sauce. Broiling is a delicate art, if you’re not careful things can get ugly. If you have a high and low setting, use your own discretion, but a high broil gets you to the finish line quicker. It starts with a head of cheddar cauliflower. 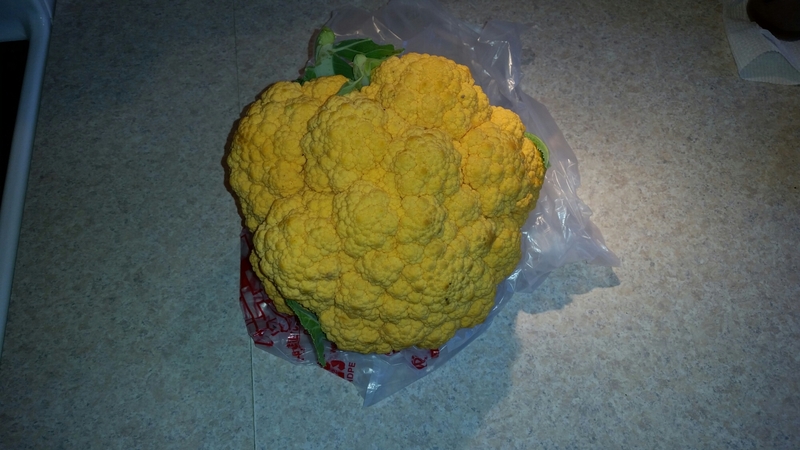 This type of cauliflower doesn’t break apart as easily as the white variety. Remove the stem and cut into small bite sized pieces. 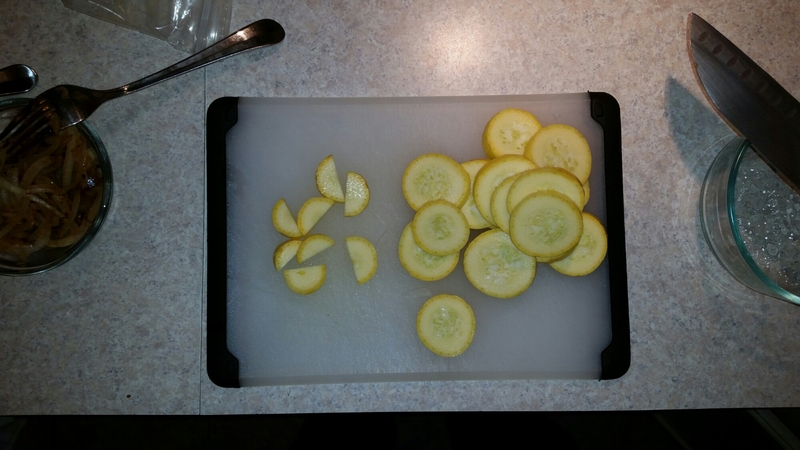 And yellow summer squash, after slicing cut into halves. 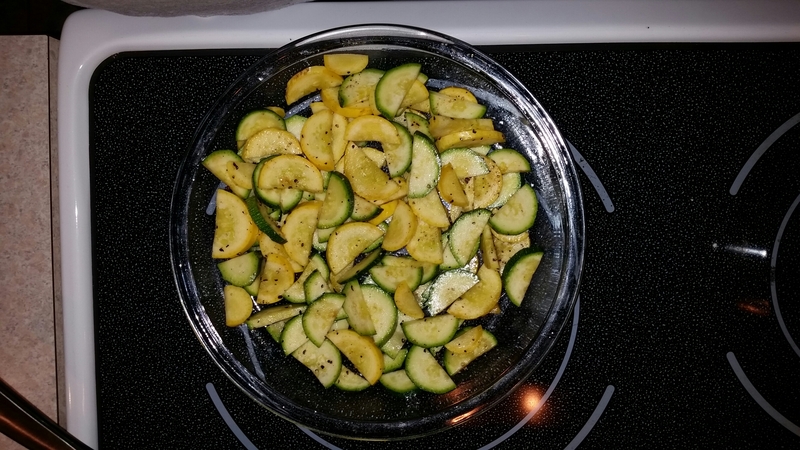 You use can a pan like this and mix the zucchini and squash with a coating of peanut oil, use the oil sparingly as you won’t need much. Roughly 20 minutes is all it’ll take. You cue to remove is once they get brown around the edges. cauliflower by the way. 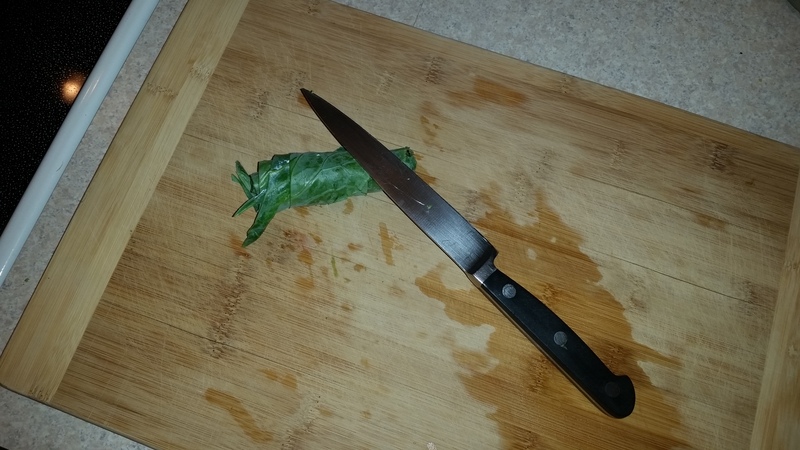 I had two stalks of broccoli that I added to the party, use the same process mind you. Since you are in the process of cutting. 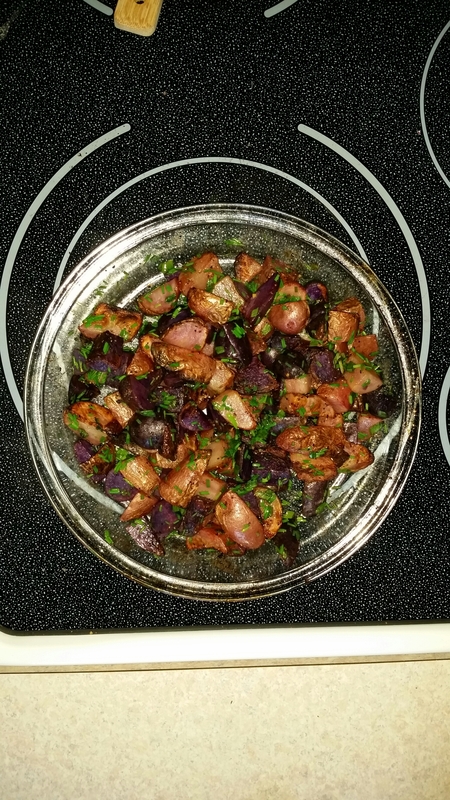 Add some red and blue potatoes into the mix. After 10 minutes in the broiler, add some freshly chopped chives and green onions and place back into the broiler for another 10 minutes. During this broiling process take care to mix to ensure even cooking. 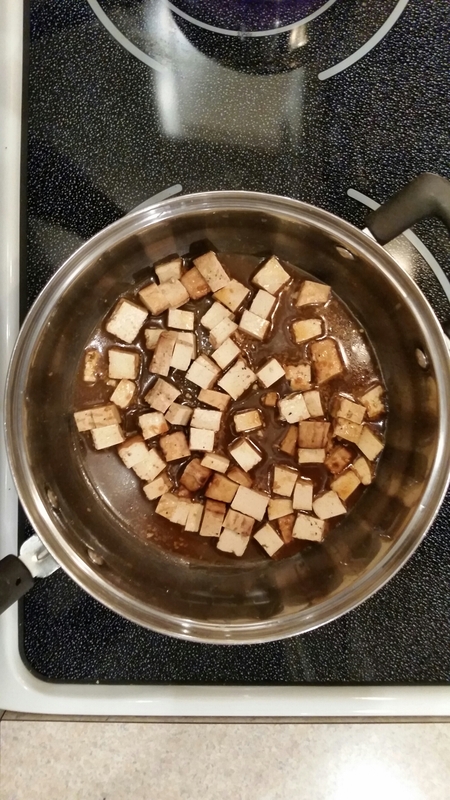 I added some baked tofu that I cut into cubes. 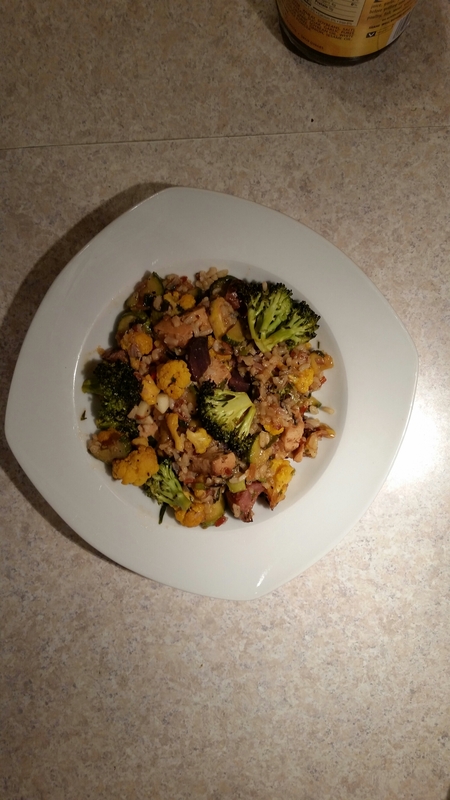 And add to a bed of rice, I used Minute Rice, there is a multi-grain medley (brown, red, wild rice and quinoa). 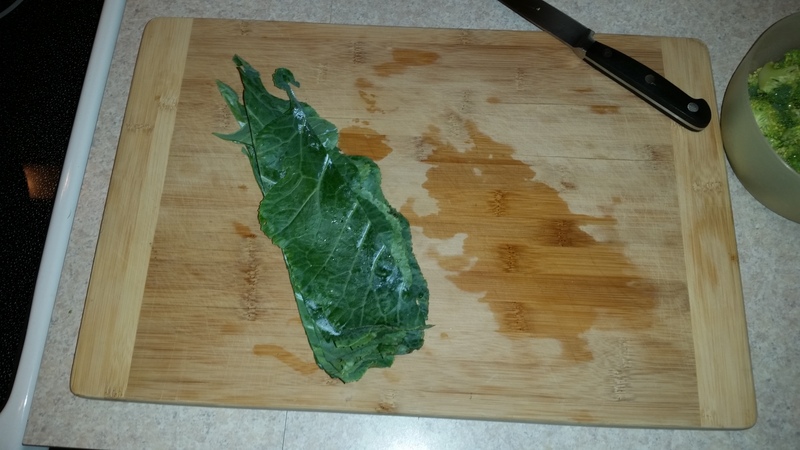 Collard Greens are a remarkably versatile green. Instead of the typical preparation of boiling them for hours on end, I decided to switch it up a bit to spice up some leftovers that I had. Cleaning the greens is a first, then separating the leaf from the stem. 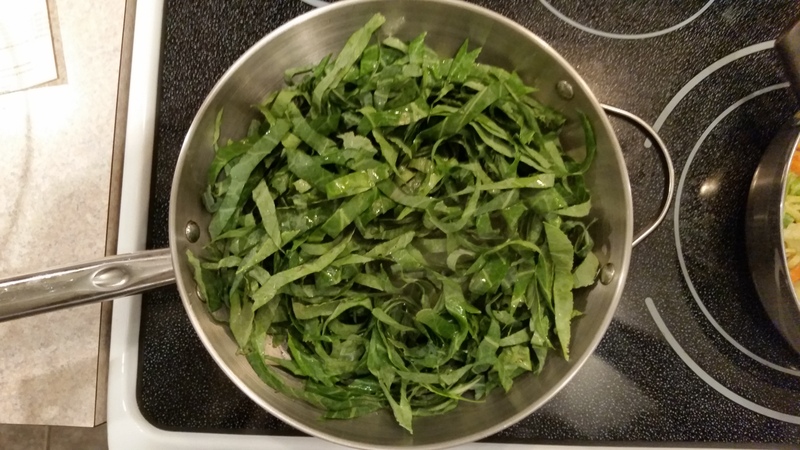 Then… Tightly roll the greens into a tight coil and slice into thin strips. Add to a heated wok, I opt for soybean or avocado oil because of the higher burn temp. 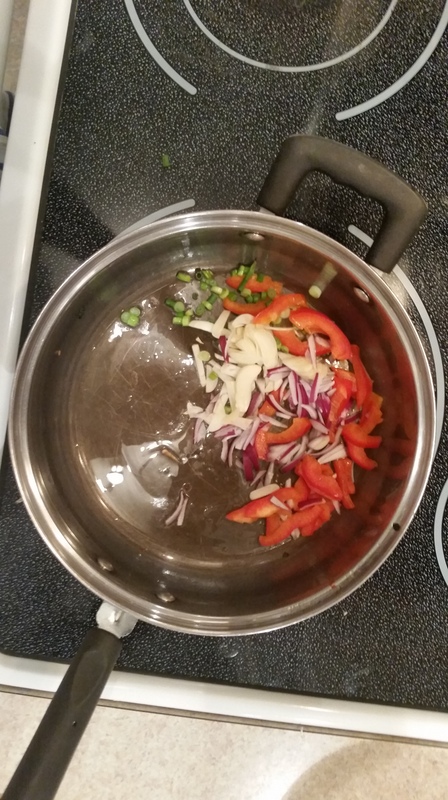 Add thinly sliced garlic, red pepper and onion (see the theme) stir-fry for 6-7 minutes, but don’t overdo it. Your cue to stop is when they are dark green. And your leftovers are reborn!